A team of patient and stakeholder partners and investigators from 20 Patient-Powered Research Networks (PPRNs) that comprise PCORnet will take part in a $4 million research project, Healthy Mind Healthy You, to determine the optimal type and frequency of mindfulness-based treatment for managing stress. This project will be under the leadership of MoodNetwork, an online network for patients with bipolar disorder and depression. The Interactive Autism Network (IAN), based at Kennedy Krieger Institute, is one of 20 PCORI-funded Patient-Powered Research Networks (PPRNs) participating in this study, which will also demonstrate the capabilities of PCORnet, the National Patient-Centered Clinical Research Network. An ambitious initiative funded by the Patient-Centered Outcomes Research Institute (PCORI), PCORnet is accelerating the nation's ability to conduct patient-centered clinical research more efficiently by using health information shared by patients and other clinical data. PPRNs, which are collaborations among patients, other stakeholders, and research partners who share an interest in advancing patient-centered research, comprise 20 of the 33 networks that together make up PCORnet. Healthy Mind Healthy You will randomly assign participants across more than 100 conditions to a "light" (3-session) or "standard" (8-session) online mindfulness-based intervention to determine which treatment is most helpful for improving well-being. This topic has been recognized as a top priority area for comparative effectiveness research by the Institute of Medicine and has the potential to inform patients, caregivers, and clinicians as to the most effective dose of mindfulness for stress and wellness management. This study will be led by a team of active stakeholder and patient partners across the 20 patient powered research networks. IAN will invite families and adults with autism spectrum disorder to participate in the Healthy Mind Healthy You study. 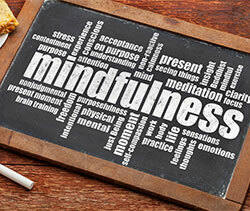 "This study will not only help people determine the right amount of mindfulness that could help them cope better with stress, but will also demonstrate how the 20 PPRNs can combine their expertise to improve the lives of people across over 100 conditions and understudied populations," said Andrew A. Nierenberg, M.D., Principal Investigator of the MoodNetwork and Director of the Bipolar Clinic and Research Program at MGH. PCORI is an independent, nonprofit organization authorized by Congress in 2010. Its mission is to fund research that will provide patients, their caregivers, and clinicians with the evidence-based information needed to make better-informed healthcare decisions. For more information about PCORI's funding, visit www.pcori.org. PCORnet, the National Patient-Centered Clinical Research Network, is an innovative initiative of PCORI that aims to improve the nation's capacity to conduct comparative clinical effectiveness research efficiently by creating a large, highly representative network for conducting clinical outcomes research that directly involves patients in the development and execution of the research. More information is available at www.pcornet.org. IAN, the Interactive Autism Network, was established in January 2006 at Kennedy Krieger Institute. IAN's goal is to facilitate research that will lead to advancements in understanding and treating autism spectrum disorder (ASD). To accomplish this goal, IAN has created two resources. IAN Research captures information directly from individuals with autism and their families to accelerate research on topics important to the ASD community. The IAN Community is an inviting library where everyone concerned with ASD can learn more about autism research. IAN is a partnership of Kennedy Krieger and the Simons Foundation, with partial funding through a PCORI Award.